In December 2006 after taking part in some Marfan research in October 2006, I was informed that my aortic root diameter was 4.3cm. This does not sound a particularly worrying measurement as most patients undertaking root and valve replacement surgery are nearer the 5.0cm mark. However, I was planning to have another child and as my aortic root measurement increased slightly during my first pregnancy, my consultant Dr Graham Stuart (Bristol Royal Infirmary), considered surgery a necessary precaution against possible aortic root rupture during pregnancy/birth. Feeling fit, healthy and not in immediate danger, it was hard to stomach the need for aortic valve surgery with all it entails, including major surgery whilst being on a heart/lung machine, long recovery time, the need to inject anticoagulants after the operation etc. After meeting a surgeon in Bristol, I decided to seek a second opinion and was pointed towards Professor Pepper at the Brompton. He offered the option of the ExoVasc procedure which appeared to be a win-win solution. Putting a stent around my aorta seemed sensible. Firstly it meant leaving my aorta intact and it had the added bonus of having only a 3 month recovery period and no need to take anticoagulation medication for the rest of my life. It also meant the possibility of coming off Atenolol in the future and being medication free. I was considered a good patient for the operation. I did not hesitate in agreeing to the surgery and asked to be operated on as soon as possible. It did not worry me in the slightest that only eight ExoVasc operations had taken place to date. Someone had to be the ninth! I was able to have the operation in March 2007 and have not looked back since. The treatment at the Brompton under Professor Pepper was both incredibly stress free and of a very high standard. After only 5 days in hospital I was home and within a couple of months, I felt my old self. I can genuinely say I suffered very little pain, more discomfort and tiredness for a few weeks. I was allowed to try for a baby within a few months and in November 2007 I fell pregnant and so my due date is the end of August 2008. Being the first person to become pregnant after an ExoVasc operation, I am being closely monitored in Bristol by the Marfan clinic and there appears to be a lot of interest in my case from the medical staff. Following an MRI scan my ExoVasc is holding well and there is no change in aortic measurements. Hopefully I will have a natural birth with no complications (like my first pregnancy) and the ExoVasc has given me and the medical team the reassurance that was needed. I cannot thank enough Professor Pepper, Tal Golesworthy, Tom Treasure and all the other people involved in the invention of this ExoVasc procedure. I hope it will benefit many other patients in the future. 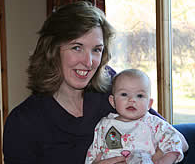 I gave birth to Gemma Allen on 19 August 2008 only a few days before the due date and had a very smooth delivery. I was advised to have an early epidural in order to keep the pressure off my heart which I agreed to. I delivered Gemma within a few hours and the medical team at St Michaels Hospital in Bristol were very attentive and supportive. I felt a fraud as my delivery was highly monitored but totally unremarkable. I had an echo before leaving the hospital which proved that the ExoVasc had done its job! My aortic root had been fully supported and my blood pressure never rose particularly high. 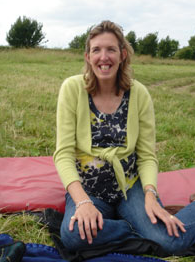 Gemma is gorgeous (and does not have Marfan syndrome) and particularly precious as she is proof of how the ExoVasc made her existence possible.